My Two Blessings: I got an A! I got a 95 on my final which resulted in a A in my Modern Fiction course. I'm so glad I took this course, but it was truly a brain drain with all the writing that was required. I'm not complaining, otherwise would have never been exposed to the stream of consciousness styles of Virginia Woolf in "To the Lighthouse" or James Joyce's "Portrait of the Artist as a Young Man." Or reread Joseph Conrad's "Heart of Darkness." Nor would I have ever read the feminist poetry of Hilda Doolittle or Wilfred Owen's war poems. Or be introduced to the post modern author Don Delillo who wrote "White Noise." Now I can say I've read Virginia Woolf, I've read James Joyce. Did I like their stream of conciousness styles. Am I richer for it? Not necessarily, but wiser when it comes to modern literature. I have one more lower level class left. The lower level course will be taking is History of Ancient Art: Ancient through the 14th Century. It starts in November, so I'll actually have a couple months off. I already took History of Western Art since the 15th Century and learned so much. And the good part is I get to use the same book. Remember this huge tome. It's a heavy sucker but full, full, full of so much information. After this class I have 4 upper level courses remaining and have established a depth in literature, so my remaining courses should prove to be interesting. Wow, oh wow! Congratulations! That is so fantastic! Woo Hoo!!! Way to go. Congrats!!! Good for you. I'm sure that was a lot of work but you did it. Congratulations. Good luck on your next one. way to go! this is an excellent achievement! The great thing about Stokstad is that her book is actually pretty readable. You can definitely get a sense of her personality in the book. I remember once I was reading about Durer's self portrait and "his long, flowing hair," and I called my friend in the same class and asked her if she thought Albrecht Durer was hot. 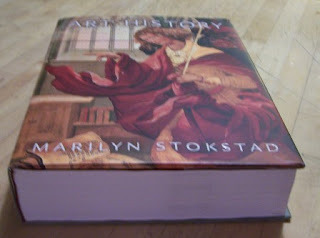 She was like, "... Have you been reading that art history book again?" EEEEEEEEEE! Congratulations! (Even if I'm so horridly, awfully late to congratulate you.) That's a fantastic result!